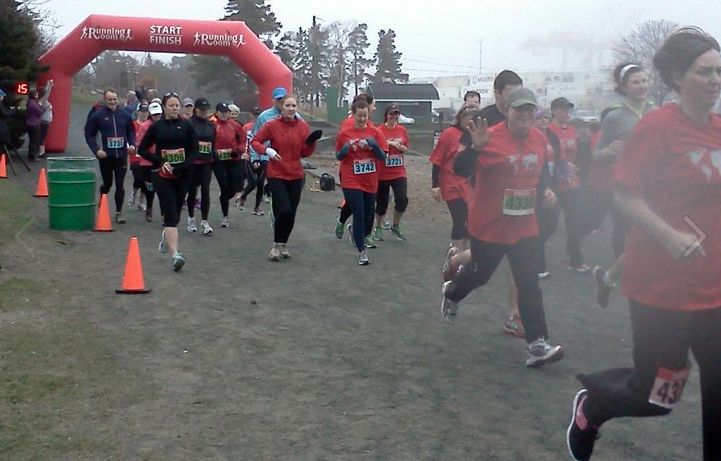 The inaugural Run Without Borders, Halifax took place this past weekend in Point Pleasant Park, Halifax. I am happy to announce that the event was a great success! Approximately 125 people took part in the event, either as volunteers, runners, or walkers. Despite the gloomy Halifax spring weather, everyone was in good spirits and seemed to enjoy the event. Together, we raised $4,719 for two international health promotion organizations: Doctors Without Borders and the Nova Scotia Gambia Association. This money will be split evenly between the two non-profits, meaning that each organization will receive $2,359.00 in donations. Woohoo! All this from just 125 people! I was blown away, once again, by the positive energy and spirit of the running, walking, and volunteering community. A small donation by each person, in the form of a race registration payment, really added up, and this money will go a long way to save lives through both organizations. It was a lot of hard work to organize such an event, but the excitement of race day definitely makes it all worth it. A quick shout out to some key people that helped make this event happen: Sydney and John from Running Room, Kelly, Caila, Michelle, Iwona, Pam, Steve, Jean, as well as all to all the race sponsors. Thanks again to everyone that participated in this event! Hope to see you out again next year! This entry was posted in Charity Run and tagged Charity, charity run, Charity Team, cross country skiing, motivation, running, volunteer. Bookmark the permalink.